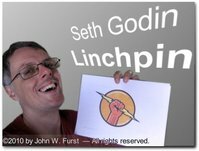 Seth Godin does not exactly have the reputation of writing How To books for dummies. And his latest book Linchpin: Are You Indispensable? — to be released on January 26, 2010 (audio book on February, 9) will not be an exception. Let me talk a little bit about this amazing book. I also had the honor that Seth answered me a couple of questions about the book. All here in this blog post. Stay tuned. …and even more reviews by my friends from <Triiibes.com>. Posted by John W. Furst in Business Strategy, Marketing, Seth Godin, Top Posts on Friday, January 8, 2010 has got 7 Comments. It seems that I am in the mood of discovering more and more browser toolbars this month. Just recently I have recommended 3 browser toolbars, which are available for Firefox and Internet Explorer (IE). Stuble Upon Toolbar for discovering new Web sites and being part of the Stumble community of 3 million people Web enthusiasts. Andy Beard says Google Toolbar Is Not Family Safe (↑) and removed it. Well, that might be true, simply don't let your Kids on your computer. There are many more areas of danger. Today I have another 2 toolbars that I want to tell you about. Since I am using Firefox, I did not even check, if those or similar ones are available for IE. Posted by John W. Furst in SEO, Usability, Web Site Development on Wednesday, November 14, 2007 has got 5 Comments. Art Or Funny Advertising - What Do You Think? I admit, I click the “Stumble! Button” every once in a while, and find some curious things from time to time. Is it Web Art or a form of Advertising? Since you can rent a virtual apartment in this tower, it's more a form of advertising, but it certainly has some art-factor, too. I have set up my Stumble Preferences that I get Web content related to my business as well as my hobbies, like photography. The homepage of StumbleUpon.com is the entry point to a large virtual community, whose members discover, comment and vote for Web pages. Currently there are 3,864,876 Stumblers. The free StumbleUpon Toolbar for FireFox and Internet Explorer becomes your steering wheel for exploring sites other Stumblers liked. Channel surf the Internet with the StumbleUpon toolbar to find great websites, videos, photos and more based on your interests. StumbleUpon learns what you like and makes better recommendations every time you click the Stumble Button. It's a virtual social network and you can connect to your online friends easily and share your discoveries, meet new people that have similar interests, and check out what other people are discovering. Most importantly, by default your preferences are set to “family safe”, which is a good thing in those decadent days. P.S. : If you like this article, stumble it with the icon below. If you are not registered yet, register, it's fun and being an active Stumbler will also bring more traffic to your Web site. Posted by John W. Furst in Marketing, Miscellaneous on Wednesday, November 14, 2007 has got 3 Comments. Who is doing this “Rapid Paced Blogging Experiment” and the Blog reviews? It's a guy named Fank Carr at his OpTempo.com (↑) Blog. It's astonishing to watch him post more articles in a day than others write in one or two weeks or even one month. Frank has written on his About Page that his goal is to write at least 10 quality articles each day. He is posting on a wide range of topics — from celebrity, offbeat-news, commentary on general topics to how-to articles and Internet of course, but he even can write well about philosophical concerns. His articles and posts about the Internet caught my attention though somewhere. Now I remember, it was on Pat B. Doyle's (↑) Blog. Frank wrote a Blog review for her. That's how I found him. I liked the review and because Frank is currently offering to write reviews, I contacted him. Not only are his reviews well structured and valuable, he writes them for free right now in order to promote his new Blog. Posted by John W. Furst in Usability, Web Site Development on Thursday, October 25, 2007 has got 2 Comments.